Are we sleepwalking into a new global crisis? Global risks are intensifying but the collective will to tackle them appears to be lacking. Could the world be sleepwalking into a crisis? Global risks are intensifying but the collective will to tackle them appears to be lacking. Instead, divisions are hardening. Geopolitical and geo-economic tensions have risen among the world’s major powers and now represent the most urgent global risks, according to the World Economic Forum’s Global Risks Report 2019. Nine out of 10 respondents to our annual Global Risks Perception Survey said they expected the risk of both economic and political confrontations between major powers to increase this year. A similar proportion expects further erosion of multilateral trading rules and agreements. The world has moved into a period of divergence following one of globalization that profoundly altered the global political economy. Reconfiguring the relations of deeply integrated countries is fraught with potential risks. This was borne out during 2018, as trade and investment ties deteriorated among many of the world’s powers, notably including the United States and China. This in turn has led to increased nervousness about the resilience of the world economy, which remains in a post-crisis recovery phase. It is not just a question of how much policy firepower is now at the disposal of monetary and fiscal authorities. Deepening fissures in the international system might stoke more fundamental vulnerabilities. If another global crisis were to hit, would the necessary levels of global cooperation and support be forthcoming? Probably, but the tension between the globalization of the world economy and the growing nationalism of world politics is a growing risk. In a world of shifting power and divergent values, it is likely to become more difficult to make progress on shared global challenges. Such progress requires two things: alignment on priorities for action, and then sustained coordination and collaboration. The example of climate change shows that, even when the first is possible, the second can be challenging: broad consensus has been built up over decades – culminating in the signing of the Paris Agreement in 2015 – but even full implementation of current commitments will not be enough to prevent damaging levels of global warming. 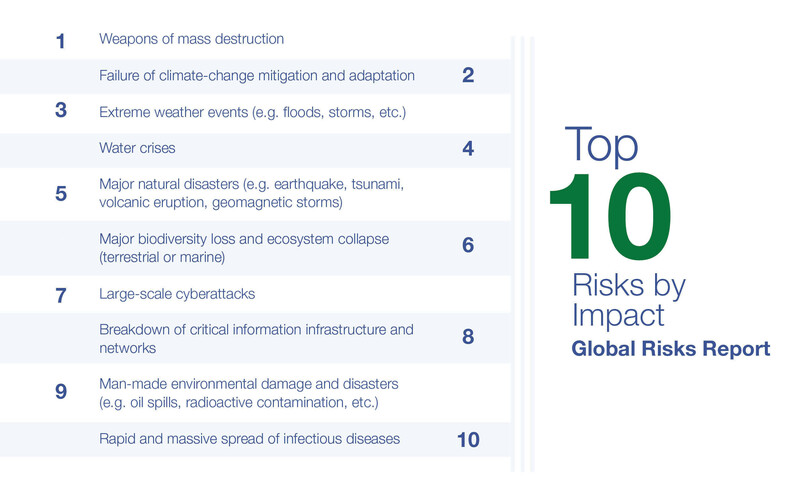 Environmental risks now dominate the 10-year outlook in our annual survey. 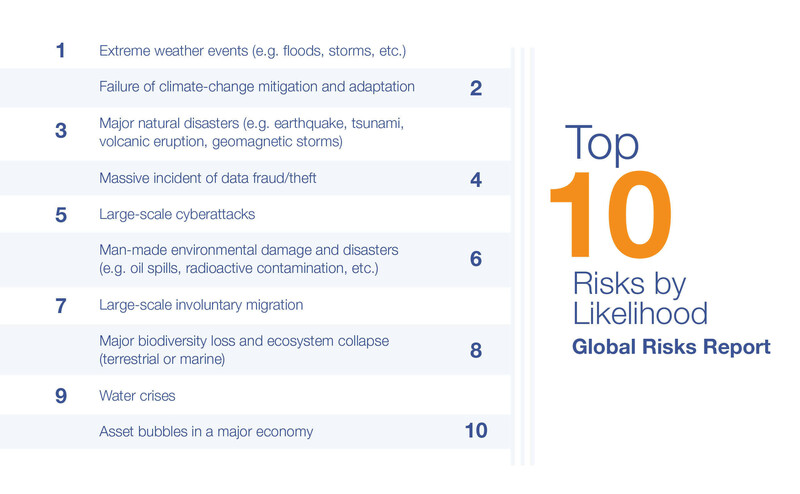 This year they accounted for three of the top-five risks by likelihood and four by impact. Extreme weather was the risk of greatest concern this year, but respondents’ worries about environmental policy failure have intensified. Having fallen in the rankings after the Paris Agreement was concluded, “failure of climate-change mitigation and adaptation” jumped back to number two in terms of impact this year. If the world still struggles to align on environmental risks, how much more difficult will it be for risks that are newly emerging and rapidly evolving? Technology is an obvious example, with the pace of change at times threatening to overwhelm the absorptive capacities of individuals and societies. There has been a notable increase in the prominence of technology in our annual survey over recent years. Cyber attacks and data theft are now viewed as among the most serious global risks and large proportions of respondents also expect 2019 to see increased risks related to fake news, identity theft and loss of privacy. Despite this increased prominence, however, the pace of change means technology remains a potential blind-spot for the world. As the technologies of the Fourth Industrial Revolution push further ahead into revolutionary new areas, the associated risks that we face are likely to be transformed. 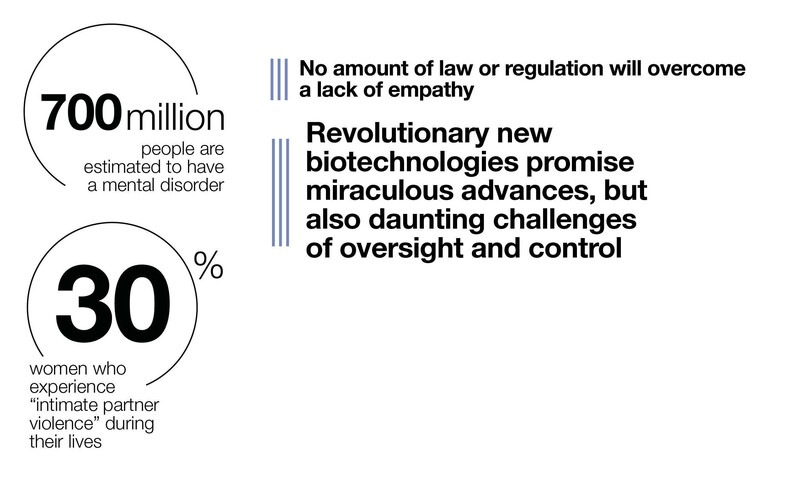 In this year’s Global Risks Report we discuss how emerging biotechnologies are blurring the lines between humanity and technology. Late last year, for example, it was claimed that gene-editing tools had been used to create genetically modified babies. Whether countries each chart their own course in areas like this, or instead align around shared approaches, could have important implications for the future of humanity. The deep interconnectedness of our international systems – economic, political, technological, environmental – is transforming the global risks landscape. Nostalgia for simpler times is a tempting but inadequate response, not least because previous periods in history have hardly been free of global risks. The task now is not to wish complexity away, but to try to understand the global changes that are taking place and learn how best to respond collectively to the challenges they present.